When I was a kid, “The Rocky and Bullwinkle Show” was shown in reruns, and I would often catch an episode or two. It wasn’t my favorite show by any means because Bullwinkle always drove me crazy. I think it was his voice, but it could have been any aspect of his goofy self. 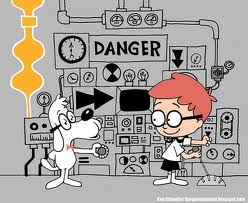 However, I was fascinated by Mr. Peabody and his WABAC Machine and the idea of going back to witness historic events. Obviously, I was a weird child to like the time-traveling, talking dog over the goofy, talking moose. Through the years as a historian, I keep going back to Mr. Peabody and thinking how cool it would be to actually be present at historic events. I have even been known to mention the WABAC Machine in class. I know the students have no idea what I am talking about, but they aren’t usually listening anyway. Of course, time travel, as we know through countless references in popular culture, has it drawbacks. We could alter the course of history and change the world as we know it. That’s why I favor the “duck blind” method from “Star Trek”. Use a force field to hide a viewing station in the natural terrain. If walking about is needed, then use an individualized force field for hiding a protection. See, problem solved. All you have to do is combine the worlds of Mr. Peabody and Mr. Spock, and the problem is solved. So, if I could board Mr. Peabody’s WABAC Machine to travel to a “duck blind” from “Star Trek”, then these are the historic events I would venture to see. 1. Montana Territory, 1876 – George Custer and the 7th Cavalry find their way to the banks of the Little Big Horn River. There they find Sitting Bull, Crazy Horse and hundreds of Sioux and Cheyenne warriors. The Battle of Little Big Horn does not end well for Custer and his men, but for the Native Americans it is a classic case of winning the battle and losing the war. After the defeat of one of America’s most famous soldiers, the U.S. Army makes it a point to bring an end of the Indian Wars. The battlefield is my favorite historic site, as I can sit on the hill and sense the history around me. It is probably the markers that designate the places where soldiers fell (although inaccurately) that make the battle easy to track over the terrain. 2. Dayton, Tennessee, 1925 – As a publicity stunt, leaders of Dayton arrest John Scopes of breaking a new law disallowing the teaching of evolution in public schools. The stunt gets out of hand when two of the nation’s most famous lawyers. William Jennings Bryan and Clarence Darrow, agree to fight it out in court over the difference between the creation story of the Bible and the theories of Darwin. It must have been a fascinating scene as a circus atmosphere descended upon the town. I love teaching about the Scopes Monkey Trial and have even taken a group of students to the actual courtroom to discuss it. I am amazed that 86 years later we are still fighting over the same issue. 3. The Moon, 1969 – Neil Armstrong and Buzz Aldrin became the first people to walk on a celestial body that was not Earth. This is the greatest achievement in human history. Watching the astronauts leave the capsule and walk around would have been a literal other-worldly experience. Also, viewing this event as it happened would prove to the skeptics that it wasn’t faked. Next semester, one of our history professors is offering a class on conspiracy theories and why people latch on to them. You would be amazed at the amount of students who do not believe that the truth is known. 4. Maryville, Tennessee, 1974 – This event is on a more personal level. My dad used to sponsor a men’s slow pitch softball team, a hobby for which he was inducted in the Tennessee Softball Hall of Fame. His teams won 10 state championships, but the first came in 1974 against the Number 1 ranked team in the nation. Actually, I was there, but I do not remember it. I was 4 years old at the time. The game was close and came down to a diving catch for the last out. I would like to go back for several reasons. First, I would like to watch the game. Second, I would like to see my dad and all of the people who I know as they looked in 1974. Third, I would like to see what I was doing as a 4-year-old. Those are my WABAC wishes. If I really had a machine, then I would go to those events first. Of course, I would not be able to stop there and would get addicted to the travel. I would also probably start messing up the timeline. Where would you go if you had access to the WABAC Machine?